There’s nothing better than waking up and smelling breakfast already waiting for you! Thanks to the invention of the crock pot, I woke up to a hearty, yummy breakfast this morning. I received the Cooking Light Slow Cooker cookbook for Christmas and decided I HAD to try the Maple-Hazelnut Oatmeal. 1. Bring milk and water to a boil in a saucepan over medium-high heat, stirring frequently. 2. Place hot milk mixture, apple, and next 5 ingredients in a slow cooker coated with cooking spray, stir well. Cover and cook on LOW 7 hours or until oats are tender. 3. Ladle oatmeal into individual bowls; top with maple syrup and hazelnuts. 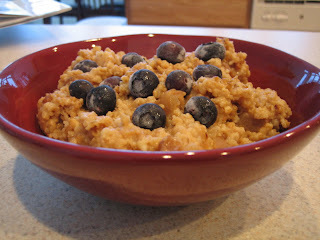 Yield: 4 servings (serving size: 1 1/4 cups oatmeal, 1 T. syrup, and 1 1/2 tsp. hazelnuts). As you can see, we didn’t have any nuts so I just used some blueberries. Also, I used a slow cooker liner which would REALLY help with clean up. Bring milk and water to a boil in a saucepan over medium-high heat, stirring frequently. 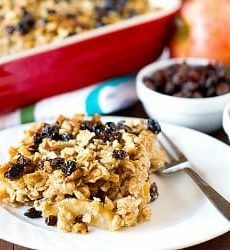 Place hot milk mixture, apple, and next 5 ingredients in a slow cooker coated with cooking spray, stir well. Cover and cook on LOW 7 hours or until oats are tender. Ladle oatmeal into individual bowls; top with maple syrup and hazelnuts. 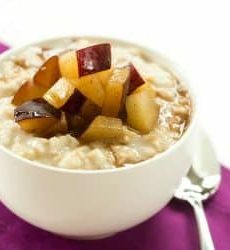 Yield: 4 servings (serving size: 1 1/4 cups oatmeal, 1 T. syrup, and 1 1/2 tsp. hazelnuts). As you can see, we didn't have any nuts so I just used some blueberries. Also, I used a slow cooker liner which would REALLY help with clean up. When it comes to creativity recipes you really have a gift. I always just imagined oatmeal as just oatmeal maybe a little sugar for favor at best. You make me believe the possibility for cooking are endless. I’m looking forward to trying this. 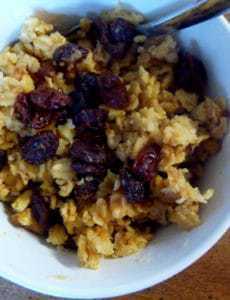 We make a slow-cooker oatmeal that puts all of the ingredients in a Pyrex measuring cup and then uses the slow cooker as a water bath. (Pour water halfway up the sides of the measuring cup. The measuring cup can be a pain to clean up, but it’s a lot smaller. I love that you post these links from the past along with your new posts. I’m getting ready to try this for the kiddos tonight!